Just a 5-minute walk from the Casco Bay Lines Ferry, this waterfront hotel offers free airport and local shuttles, an indoor heated pool and fitness center. Every room features a flat-screen cable TV with HBO. A microwave, fridge and coffee maker are included in the contemporary rooms at Hampton Inn Portland Downtown Waterfront. There is free Wi-Fi along with a desk. Ocean view rooms are available. Guests can enjoy a breakfast buffet featuring Belgian waffles, eggs and sausage. Coffee is available 24 hours a day at the Downtown Portland Hampton Inn. Portland Observatory, Maine Narrow Gauge Railroad and Longfellow House are within a 13-minute walk of this hotel. Portland International Jetport is 5 miles away. Please note that the airport transfer service has limited hours of operation. Contact the property for details. Guests are required to show a photo identification and credit card upon check-in. Please note that all Special Requests are subject to availability and additional charges may apply. 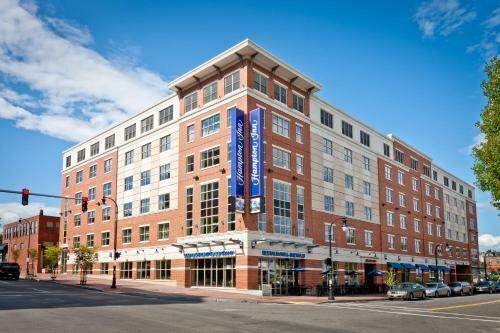 the hotel Hampton Inn Portland Downtown Waterfront so we can give you detailed rates for the rooms in the desired period.